So we are already familiar with the Euler method from the previous post. This method is lacking because it assumes constant acceleration through your whole timestep, which is usually not true. It still works though because the steps are small enough it doesn't matter. RK4 suffers from the same flaw, but improves on the method by taking a few acceleration values and averaging them. As we are fourth order, we're taking four approximations. k1 = acceleration based on your bodies location at the starting point. These weightings are determined by a butcher table, which I don't totally understand, so I'll just link to wikipedia. The result of this average is that now our value contains information about how the acceleration will change throughout your timestep, and corrects accordingly. It's similar to the Euler technique if the timestep were four times smaller, but since we don't update the location of all the other bodies for the k calculations, it requires less computation. Less computation is good! As we are introducing a new integration method, I decided to make individual classes for the RK4 and Euler integrators. These are created by passing a list of gravitational bodies, and a time step duration. Integrators must also declare a compute_gravity_step function. 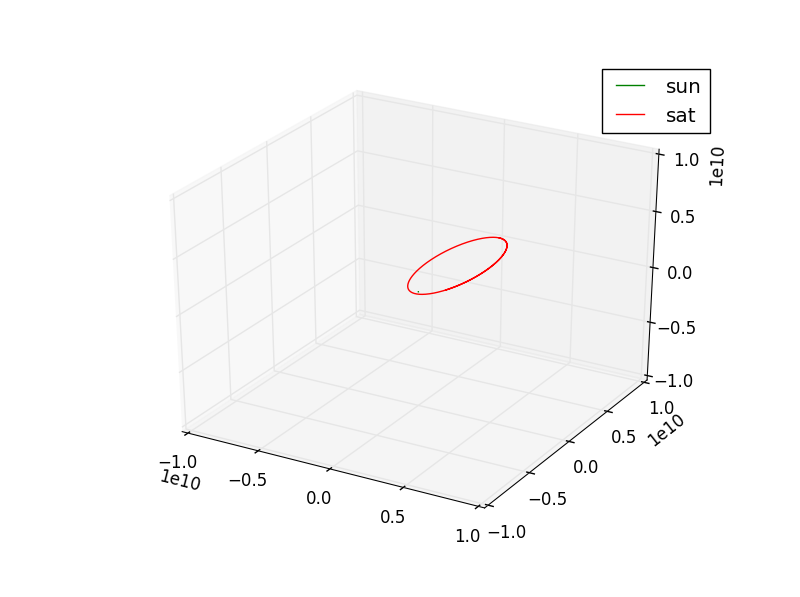 In RK4, the location and velocity updates remain the same as in the Euler case, which is to say simply the time step multiplied by the acceleration to get updated velocity, and timestep multiplied by velocity to get updated location. The interesting bit is inside our new calculate_single_body_acceleration function. In this function, we now add the four k values as described in the previous section. The full run-able python script can be found here. In the following orbit graphs, you can see the benefit of RK4. 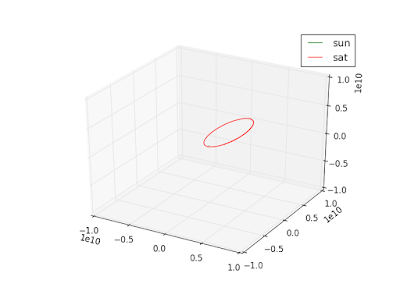 In these examples, I created an artificial satellite object and placed it near the sun with some random velocity. 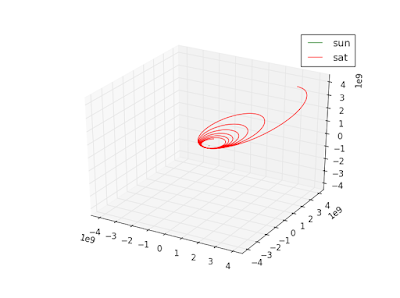 When using the Euler integrator, it appears to enter a stable orbit. 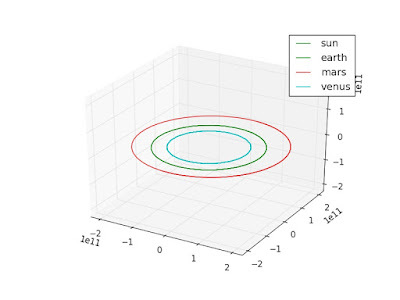 When using RK4 however, the forces while passing the sun reveal a decaying and unstable orbit. 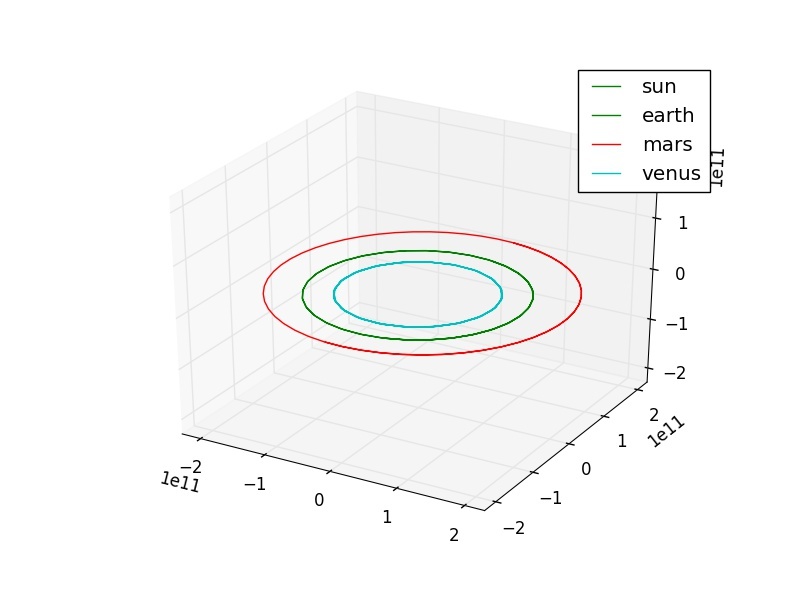 Our python orbit simulation is pretty neat, but if you add all the planets into the mix and it gets pretty slow. While there are a lot of ways to make python run fast, like simply using numpy, most high performance python is really just calling C or C++ code underneath. When it comes to performance, I prefer to skip the middle man and go straight to C++. I also plan to add some parallelism in future posts, so I decided now was a good time to go to C++. So I implemented this simulation in C++ including RK4. The program layout is very similar to python, and can be found on github here. There is nothing parallel or performance oriented here yet though, besides the properties of the languages. Checkout the README for build instructions. The main deviation from python is simply syntax, I overloaded the point basic math operations, so now the component wise (a.x += b.x) automatically occurs without explicitly writing it. To compare the performance of the two, I was going to just show some bar charts. The differences are so huge though, the C++ bar doesn't even appear visible, so I'll go with a table instead. So we see C++ providing over 100x performance simply by changing languages! If you'd like to take a crack at getting some python performance numbers, I'd love the discussion. In future posts I'll be discussing threading and maybe even GPU acceleration if I can build a system large enough to require it. Please let me know if you have any good material regarding the Fast Multipole Method! Are you familiar with the Java programming language? 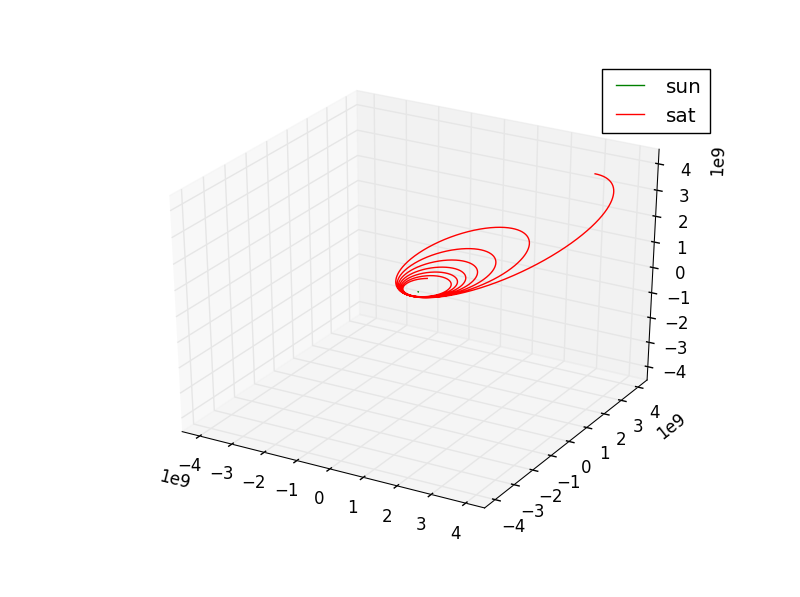 I have written the RK4 algorithm for my Solar System simulation but, when I run the program with RK4 the orbits of the planets diverge from their original trajectories very fast as the system appears to gain energy somehow. I can't see my mistake! I have asked a few people with many years of programming experience to look at my code and all of them have said it looks correct! Is there any way you could look at my code? It is a hard thing to debug if it's not work... Are you using a visual debugger? I would implemented Euler (very simple) and then print or view RK4 and Euler steps for the same body. See if you can pinpoint what component is changing at the wrong rate. Thanks a lot for this! One quick question though. I tried running your RK4 code for a few solar system planets, and found that they all fly away from the sun. I wrote a Euler n-body integration and did not see this behavior. Do you know what might be going on? Hey, very good question. Honestly I don't understand what exactly this means, but there was some excellent discussion on reddit around this where a commenter explained RK4 is not symplectic (https://www.reddit.com/r/Physics/comments/5tf61n/nbody_orbit_simulation_with_rungekutta/). I have been meaning to understand the differences better and make this post more accurate and educational! This information was very useful to me and I thank you for this.keep sharing more like this.